The Crypto Crew Finds Possible Bigfoot Track! Releases Photos! 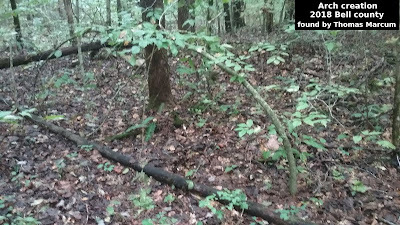 The Crypto Crew's Team Member Waylen Frederick has discovered what is possibly a rather large bigfoot track. We will not disclose the actual location at this time other than to say it was in the southern part of United States. The cigarette pack is 4 inches long making the print around 12 inches from big toe to heel and about 5 inches wide. There is still some toe definition in this track even though we believe and estimate that the print is 30 day old or more. It was found in an area crossing a saturated logging road that is about 10 feet wide and this was the only track and it was in the center of the road. So we can guesstimate that the other tracks were out of the roadway, which would mean about a 5 foot stride or more. The track was coming from and going back into a dense thicket,which is common along the sides of old logging roads. We attempted to but were unable to reproduce the track depth,which means that whatever made this track most likely weighted more that us. Waylen's brother placed his foot beside the track as seen in the above photo, his boot is 13 inches in size. There is also what appears to be a mid-tarsal break, which is a little more visible in the first photo. No dermal ridges were visible in the track but could have been gone due to the track being about 30 days old or more. This track was found on some farm land that is behind a locked gate and in a remote type area. There is no public access allow on this property and it is family owned. This track was originally found on 1/28/2012.